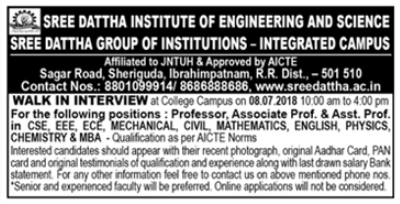 Sree Dattha Institute of Engineering and Science, Ranga Reddy has advertised in the DECCAN CHRONICLE newspaper for the recruitment of Professor / Associate Professor / Assistant Professor jobs vacancies. Interested and eligible job aspirants are requested to walk-in on 08th July 2018. Check out further more details below. About College: Founded in 2001 by Vyjayanthi Educational Society, Sree Dattha Group of Educational Institutions represents a rich tradition of excellence in technology-based education. A premier-league institution among the affiliates of JNTU, Sree Dattha Group of Educational Institutions owes its vision to Sri G. Panduranga Reddy, a veteran statesman of Independent India. The rapid rate of technological advancement and the information revolution has opened new challenges as well as opportunities. Sree Dattha Institutions aim to prepare the students to be successful in the changing work place. It aims to equip the students with technical knowledge and capabilities, flexibility and understanding of the societal context of the corporate world.